The chapter in history known as the Baroque lasted about a hundred and fifty years, give or take. Music historians tend to divide the period into the early Baroque (about 1600 to 1650), the middle Baroque (about 1650 to 1700) and the late Baroque (about 1700 to 1750). Now I have to admit that these years are somewhat arbitrary, but at least they’re round figures. Wikipedia differs on this matter and so does one of my favourite reference books but of course, it all depends on what criteria you use. In any case, it’s a bit misleading to state specific years because the Baroque movement gradually crept in over a period of time. The first signs appeared in Italy and the movement gradually spread across Europe. You can find Baroque elements in painting, sculpture, theatre, literature and architecture. So what was the Baroque? Let’s allow a few generalisations. Baroque painting for example, was characterized by three things: a sense of grandeur, sensuous richness and powerful dramatic content. Baroque architecture used grandiose designs and elaborate detail and was intended to impress. 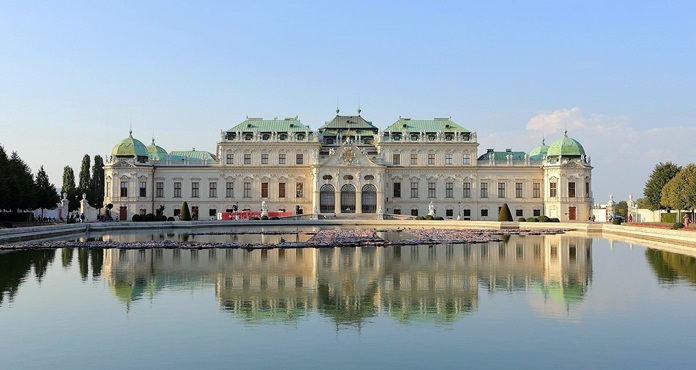 Palaces, such as Prince Eugene’s stately Belvedere palace in Vienna, were invariably built around an imposing entrance with a grand and symmetrical façade of breath-taking opulence. The three greatest composers of Baroque music were Bach, Handel and Vivaldi and their music reflected some of these characteristics. Contrast and detail were two of the most important elements. Melodies were made increasingly complex with the addition of trills and various other ornaments. Rich and sonorous textures were used and the music was given a sense of urgency through the use of energetic rhythms. It also had to be dramatic. Just think of the electrifying start to Bach’s famous Toccata in D minor for organ. The violin and trumpet became increasingly popular as solo instruments. Baroque music used the so-called basso continuo, which was an accompaniment improvised by a keyboard instrument over a given bass line and harmonic pattern, supported by a bass instrument, usually the cello. It was used extensively throughout the Baroque because it provided the fundamental rhythm and harmony, thus freeing up the other instruments or voices to weave elaborate contrapuntal patterns. Here’s a delightful musical treat, despite the fact that it was recorded twenty five years ago in 1991. Handel was rather ahead of his time in that he spent most of his career as a freelance composer – and a successful one too, receiving living expenses from a succession of monarchs. Samson is a three-act oratorio dating from 1741. The aria Let the bright Seraphim has remained especially popular and appears towards the end of the work. The premiere at Covent Garden in London in 1743 was so successful that a further six performances were hastily arranged. But just listen to all those hallmarks of the late Baroque! There are bright lively rhythms, a prominent part for the trumpet (in this case the piccolo trumpet) which responds to the singer’s phrases and creates an impression of grandeur and celebration. The soprano sings an elaborate and virtuosic baroque-style melody using melismata – the word used to describe singing a long succession of different notes on a single syllable. There’s a typical contrasting section in the middle of the aria and you can see the continuo harpsichord behind the singer. When Vivaldi was aged about twenty-six, he began his long association with the Ospedale della Pietà in Venice. In reality, this institution was not a hospital but a home for the illegitimate daughters of Venetian noblemen who discretely helped to provide the necessary funding. The Pietà had an excellent reputation for music and the students were considered the most accomplished young performers of their time. Because they needed a constant supply of new music, it was expedient that Vivaldi should write it himself. The Gloria was one such work, composed around 1715. There are twelve separate movements, some of them quite short and yet they display all the hallmarks of the late Baroque such as the insistent chugging D’s played at the start and later, the melismatic vocal lines, the surprisingly chromatic harmony, the lively rhythms, contrasting textures, trumpet fanfares and the ever-present continuo played on the organ. Even more than the four violin concertos known collectively as The Four Seasons, this vibrant music reveals Vivaldi’s extraordinary sense of invention and imagination. If you want to get a real sense of what the late Baroque was all about, you can’t do much better than to listen to this splendid music, especially its triumphant finale.